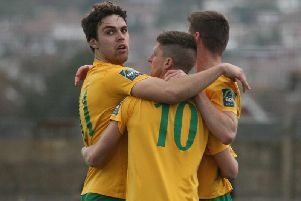 Horsham narrowed the gap on the teams above them in the Bostik League South East Division play-off places with an important 3-1 victory away to VCD Athletic. Kieran Lavery, Chris Smith from the penalty spot and Rob O'Toole were all on the scoresheet in the victory at Oakwood which adds further weight to their promotion push. The Hornets dominated the first half and led 2-0 at the break in front of a paltry crowd of 82 - many of those away supporters - as the hosts put in a forgettable first-half display. To their credit, The Vickers were much improved in the second half with substitute Malachi Hudson pulling a goal back two minutes after the break to put them on the front foot. But an O'Toole header in the 59th-minute killed the VCD onslaught and allowed the away team to see out a well-contested second period. The result helped Horsham consolidate fourth place, narrowing the gap Hastings, who drew at Whitstable, to two points with a game in hand. Ashford United, who did not have a game, are second on 48 points. Fifth-placed Haywards Heath grabbed a late winner against Herne Bay to remain in the last play-off birth. The hosts came into the clash just outside the play-off places, sitting in eighth on 35 points. They had enjoyed patchy form since the turn of the year with two wins, two defeats and a loss. The Hornets were still buzzing from grabbing an injury-time point in a 1-1 draw with Hastings United on Tuesday night. There was one change from that side with Lavery coming in for Tyrell Richardson-Brown, who dropped to the bench. Dylan Merchant returned to the squad having recovered from a back problem and minor unrelated operation, as did Dean Lovegrove, back from a dead leg suffered against Ramsgate. The first chance came in the seventh minute when a clipped ball down the channel by George Hayward was driven first-time into the box by Harvey Sparks, but Chris Smith put wide at the near post under pressure. Smith, looking like a man possessed, then chased down Jordan Beeney and blocked a clearance, but the goalkeeper was up quickly to claim to spinning ball under pressure from Rob O'Toole. The visitors had the lead they'd been threatening in the 19th minute. A well-weighted Smith pass put in Harding and as his poked effort came back off the base of the post, Lavery took a touch and finished from 12 yards. The away side continued to threaten as they broke with numbers from midfield away from the static Jack Steventon and Alastair Gordon. Pelling, who had been a spectator for much of the half, touched the ball for the first time after 24 minutes, punching away a deep Bradley Simms. As well as vocally marshaling his side, VCD stopper Beeney prevented a second just before the half-hour mark. He pushed over Smith's angled shot after the forward was slipped in by Harding. The hosts enjoyed their best spell of the ball following that, although failed to really impose in the final third. One chance to have an attempt at goal from a 25-yard free kick saw Jake McIntyre balloon over. Horsham doubled their lead on the stroke of half-time as Joe Denny was adjudged to have blocked a shot with his arm, although in the centre-back's defence, he could little to get them out of the way. Nevertheless the referee pointed to the penalty spot and Smith sent Beeney the wrong way, finishing into the bottom right. The home made two substitutes at the break as Steventon and Gordon were replaced by Malachi Hudson and Ali Fuseini. The former had an immediate impact as he pulled a goal back within two minutes of the restart as he fired goalwards from a ball across the box from the right and it squirmed underneath Pelling. Horsham then had Smith booked for a tackle that left Alex Gaggin in a heap, that was despite VCD trying to encourage more of a punishment for the Horsham striker. An already-booked Shelley had the same treatment after a fan on the edge of the box, but the referee opted for a final warning. VCD were certainly in the ascendancy and Hudson tricked past Metcalf on the edge of the box, but his near-post cross was blocked behind by a number of bodies. The visitors, however, managed to haul themselves back into a two-goal lead with a timely strike. A Harding corner could only be palmed on by Beeney and O'Toole was there to head home at the far post on 59 minutes. The remainder of the half was well contested, but the visitors' cushion allowed them to manage the game and secure their 14th win of the season. VCD Athletic: Beeney, Simms (Adeniji 66), Baker, Denny, McIntyre, Gaggin, Steventon (Fuseini 46), Gordon (Hudson 46), El-Moyhelbel, Odusanya, MacDonald. Unused: Joseph, Barrington. Horsham: Pelling, Metcalf, Shelley, Miles, Sparks, Harding, Hayward, Brivio, Lavery (Richardson-Brown 76), O’Toole (Kirkwood 88), Smith (Lovegrove 86). Unused sub: Merchant, Baxter.